Analog Artist Digital World: Liftoff. We sat in the grass with the NASA vehicle assembly building behind us. with fire minute remaining in the countdown for the OSIRIS-REx Asteroid Sample Return Mission, we stood and moved up to a yellow rope than marked the safest distance from the launch pad. Everyone in the field stood as the system checks began. Fuel systems... GO. Telemetry ... GO. Guidance... GO. It seemed like 50 different systems managers had to announce, GO. With all system go, the ground launch sequencer was go for auto sequence start and then the main engine started. We were next to speakers, so we heard the rocket fire up. Then a few seconds later, a blinding light lifted up from the horizon. The sun was setting behind us, and it helped illuminate the smoke trail a bright orange. Then the sound wave of the rocket hit us. It was deep, resonant and it could be felt rumbling through us. One person described it like the sound of a dentists suction device. It was a picture perfect launch. In 2018, OSIRIS-REx will approach Bennu – which is the size of a small mountain – and begin an intricate dance with the asteroid, mapping and studying Bennu in preparation for sample collection. 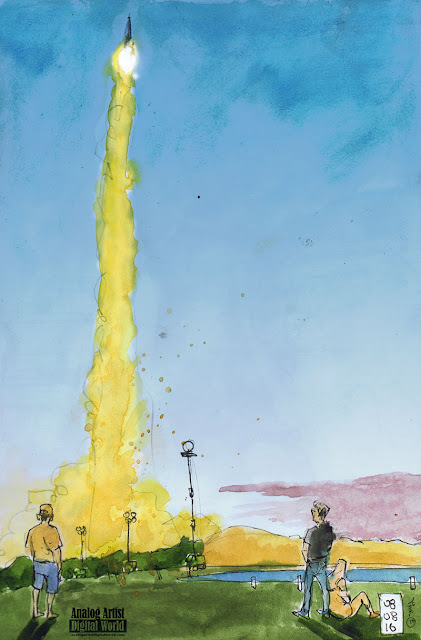 In July 2020, the spacecraft will perform a daring maneuver in which its 11-foot arm will reach out and perform a five-second “high-five” to stir up surface material, collecting at least 2 ounces (60 grams) of small rocks and dust in a sample return container. OSIRIS-REx will return the sample to Earth in September 2023, when it will then be transported to NASA’s Johnson Space Center in Houston for examination.